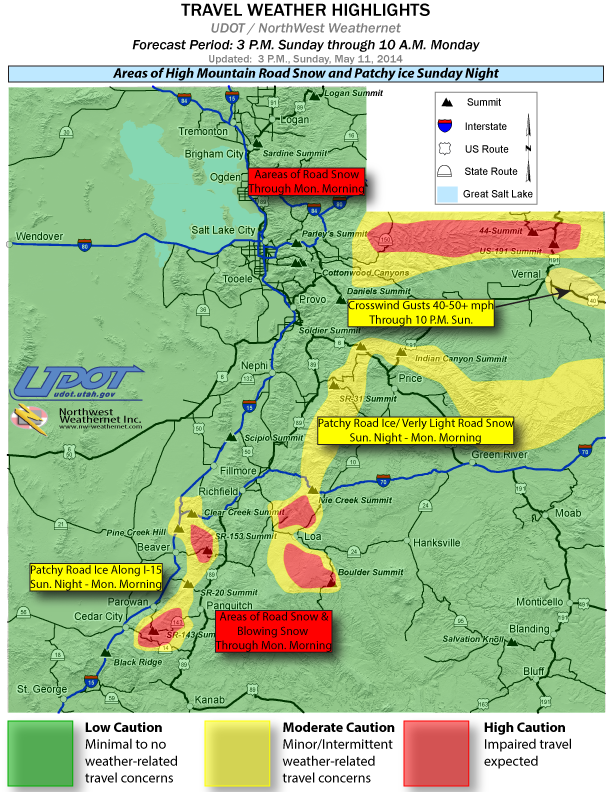 SOUTHERN UTAH – Power service and roads continue to face problems Monday morning following weekend wind, rain, lightning and snow across the region. In Cedar City, Rocky Mountain Power is reporting approximately 504 customers without power, down from 6,731 Sunday. The outages are weather-related problems associated with a storm that began Saturday night with excessive winds, rain, lightning and even snow in the higher elevations, Rocky Mountain Power Spokesperson Margaret Oler said Sunday. Crews are on site with repairs underway. The power company does not have an estimated time of restoration as of Monday morning. Northbound and southbound Interstate 15 will be closed at mile post 75 Monday for about 20 minutes, beginning at 8 a.m., for Rocky Mountain Power’s purposes. Motorists should expect delays and are urged by Utah Department of Transportation to use alternate routes. UPDATE 8:55 a.m. this advisory has been removed from UDOT’s advisories. State Route 143 is closed from mile posts 18-27, Brian Head to Mammoth Creek, due to road weather conditions. State Route 148 over Cedar Breaks is closed until Tuesday due to weather effects. State Routes 14 and 148 will experience closures throughout the week for hazardous tree mitigation being performed by UDOT crews in conjunction with the Dixie National Forest. Read more: UDOT, Dixie National Forest mitigate bug-kill trees; traffic impacts. Motorists on I-70 just east of the I-15 junction over Clear Creek Summit and over Ivie Creek Summit, east of Salina, may experience patchy ice through about 8 a.m. Monday. Summits on state Route 153 summit east of Beaver, state Route 143 east of Parowan and state Route 14 east of Cedar City may experience blowing snow and road snow through Monday afternoon. Likewise, on state Route 25 to Fish Lake, state Route 72 over Hogan Summit north of Loa, and state Route 12 over Boulder Summit south of Torrey. Light road snow and patchy ice are expected to be a threat for summits on state Route 20 east of I-15 mile post 95, and state Route 24 over Wayne between I-70 and Loa. Visit the Web page linked here or northern Utah traffic advisories. Obtain UDOT’s smartphone travel app. Thanks for this helpful information; your time and thoughtfulness. Family in Parowan has had a rough weekend. They had over 8in of snow, and lost at least one tree to the wind storm. They also state that other people’s yards look like a small twister went through the historic neighborhoods. Not sure if it’s just landscaping or buildings. We hear that church was abbreviated and included community instructions to handle the clean-up or ask for help. They seem to have it under control but it’s a total mess, under wet snow. Prayers going up.